Rand McNally Standard Map of Florida. 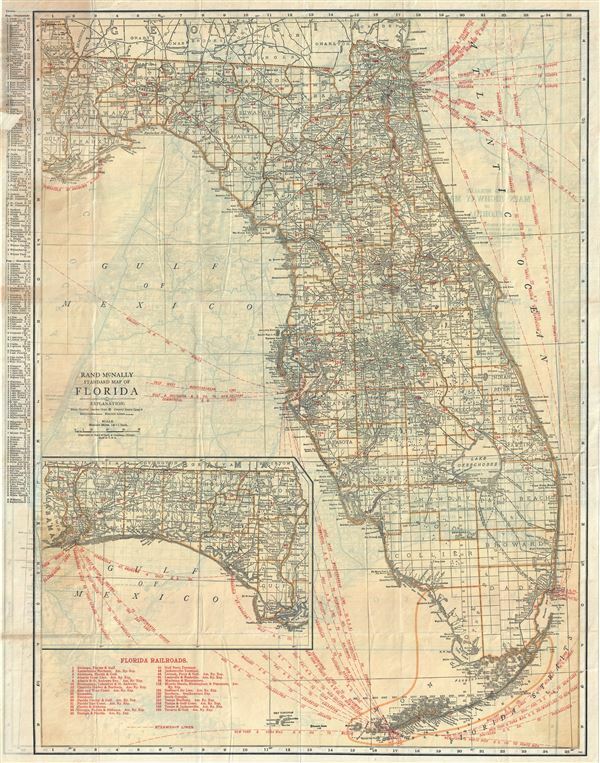 This is a scarce 1925 map of Florida by Rand McNally and Company. The state of Florida is presented with extraordinary detail throughout noting towns, cities, rivers, electric lines, railways, coastal details and a host of additional topographical features. Lake Okeechobee, the Everglades, Biscayne Bay and Tampa Bay are identified. An inset map featuring the western part of the state is included in the lower left quadrant. Several steamship lines are noted throughout. An index of counties, cities and towns is included in the lower left quadrant of the map. The map delineates survey grids and plats referencing the work of the U.S. Land Survey. Railroads are numerically marked on the map with a key in the lower left quadrant. An index in the left margin lists towns with population in thousands and hundreds. This map was copyrighted and issued by Rand McNally and Company as the 'Rand McNally Indexed Pocket Map Tourist and Shippers Guide' in 1925. Rand, McNally and Co. (fl. 1856 - present) is an American publisher of maps, atlases and globes. The company was founded in 1856 when William H. Rand, a native of Quincy, Massachusetts, opened a print shop in Chicago. Rand hired the recent Irish immigrant Andrew McNally to assist in the shop giving him a wage of 9 USD per week. The duo landed several important contracts, including the Tribune's (later renamed the Chicago Tribune) printing operation. In 1872, Rand McNally produced its first map, a railroad guide, using a new cost effective printing technique known as wax process engraving. As Chicago developed as a railway hub, the Rand firm, now incorporated as Rand McNally, began producing a wide array of railroad maps and guides. Over time, the firm expanded into atlases, globes, educational material, and general literature. By embracing the wax engraving process, Rand McNally was able to dominate the map and atlas market, pushing more traditional American lithographic publishers like Colton, Johnson, and Mitchell out of business. Eventually Rand McNally opened an annex office in New York City headed by Caleb S. Hammond, whose name is today synonymous with maps and atlases, and who later started his own map company, C. S. Hammond & Co. Both firms remain in business. Good. Overall toning. Minor wear along original fold lines. Verso repair over damaged area in top and right quadrant. Minor portion of index in top left quadrant missing with verso reinforcement. Tape residue in top left and right quadrant, does not hamper view. Professionally flattened and backed with archival tissue.